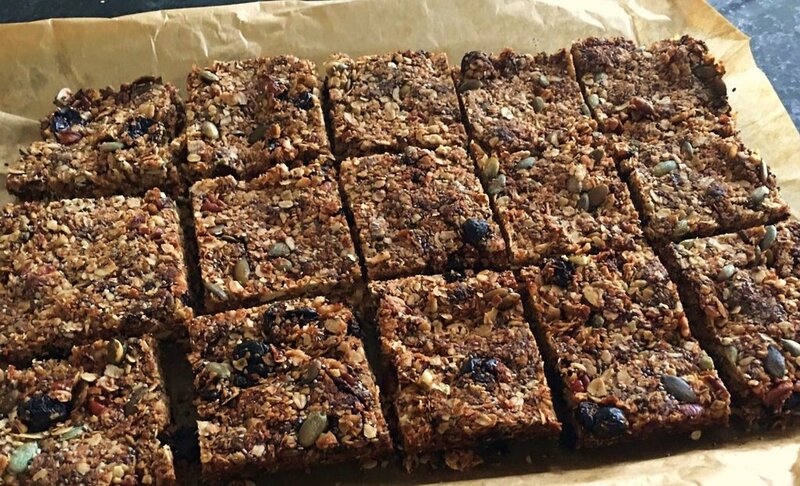 You’d be foolish not to give these CherryActive power flapjacks a go. Preheat the oven to 180⁰C/gas 4. Grease and line a 20 x 30cm cake tin with baking paper. Put the oats, pecans and pumpkin seeds on a baking tray and toast in the oven for 10 minutes, stirring occasionally, until lightly golden. Tip into a bowl and mix with the chia seeds, coconut flakes, dried fruit and vanilla extract. In a small pan, heat together the coconut oil, honey and sugar, stirring until the sugar has dissolved and the mixture starts to boil. Simmer for 2 minutes, then pour over the oat mixture. Mix well, then tip into the prepared baking tin. Press into the edges with the back of a spoon and bake for 25-30 minutes, until golden on top. Leave to cool completely in the baking tin before turning out and cutting into squares. The flapjacks will keep in an airtight container for up to 2 weeks.